“Live as if someone left the gate open” card is a great encouragement, birthday or even graduation card idea. The horse and words are from the Stampin’ Up Let it Ride stamp set. On the video I’ll show you how I watercolored the horse, and made him pop out of the “stable door”. That door was created with a combo of the Frosted Bouquet & Sliding Doors dies. The stable idea was inspired by a card I saw created by Stephanie Fischer. See the “how to” class video and free pdf for instructions, measurements and supply list. Video Class: This video class will be recorded live on both YouTube and Facebook. Join in live and be part of the taping, or catch the replay video below. This is a video comment entry giveaway. Winner drawn on April 15. To enter, simply click over to the video on YouTube and Facebook, and leave a comment. No purchase necessary. Love this card! So many possibilities. 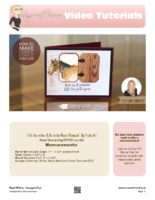 I work for an equine business so just LOVE this stamp set and card!!!!! Love Horses, nice & easy card! I want to thank you for this class! I learned so much froom you, just watching your video. Your good at showing us the pros and cons of a project as well as showing us new tricks! TFS! Have this set and Love that you showed how to use it in another way! Would love to win any of your prizes. You are awesome. Need this to make a card for my cousin, she love’s horses! Tami you are awesome! Love this card. Tami, I really enjoy all your videos. I cannot wait to make this time of card. I love this stamp set – would love to win it. Thanks for the videos. This is a great stamp set. You did a great job with this card. Love it. Love this horse stamp set!